Over the past couple of months, Green Middle School students and faculty have been raising money for the completion of the Flight 93 Memorial in Shankesville, PA. The school began selling 40+1 Heroes t-shirts the week of September 11, 2015, as a way to honor all of the courageous and the lives lost those 14 years ago. Some students were able to travel to the crash site and witness the memorial service on 9/11. There are several articles recounting the middle school students’ experiences while at the memorial. The middle school didn’t stop fundraising efforts after 9/11 had come and gone, though. 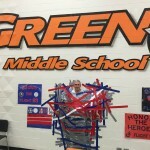 The students continued to sell t-shirts during lunch periods, collect change, and even got the chance to tape their school Principal to the wall! On October 30th, students were able to buy a piece of tape for $1.00, with proceeds continuing to support the memorial in Pennsylvania. Students also sold shirts, and went around collecting change at the schools Chili Supper. 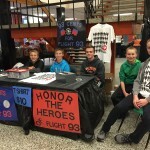 93 Cents for Flight 93 and the HALO Foundation are AMAZED at all of the efforts that Green Middle School has taken to support Flight 93 and the memorial. The school raised $1,752.80!!! That is incredible!! It is amazing to see the wonderful things that can be accomplished when people come together and work together. We are so grateful for all of the wonderful things that Green Middle School is achieving! In the coming months, the Eighth grade class will be taking their trip to Washington, D.C., but will also be making a pit stop to the memorial in Pennsylvania. We wish them save travels and a moving experience!